Based on the recommendations of the Kirit Parikh Committee, the Government of India (GOI) on 25 June, 2010 announced the full deregulation of the prices of two crucial petroleum products: petrol and diesel. Henceforth, prices of these two products will be determined by the unfettered play of market forces and government “subsidies” on these products, which worsen the fiscal situation, will be completely removed. In one deft move, therefore, government control over the determination of the prices of these key commodities was willingly ceded to the magic of the market, presumably to “rationalize” prices and to wipe away losses of state-run Oil Market Companies (OMCs) to the tune of Rs. 22,000 crore. There were generally three types of reactions to this announcement in the mainstream English news media. Firstly, the markets were ecstatic about the full liberalization of petrol and diesel prices and these sentiments were almost immediately reflected in rising oil stock prices. Secondly, there were strident complaints that this policy change was not enough: prices of kerosene and liquefied petroleum gas (LPG) were still minimally under government control and therefore even after the deregulation move, the losses of the OMCs on account of these two petroleum products would stand at Rs. 53,000 crore for fiscal 2011. Thirdly, various opposition parties have pursued their ‘Bharat Bandh’ without much vigor. In any case, this immediately bring us to the second question: what will the next committee recommend? The Kirit Parikh Committee has allowed some minimal control over the prices of kerosene and LPG. Recall that the private sector is livid with the residual losses of the OMCs (often misleadingly equated to the “under recoveries”) to the tune of Rs. 53,000 crore resulting from the marginal control that had been retained in the pricing of kerosene and LPG. Thus, even if one does not know the exact date when the next committee on petroleum prices will be set up, one presumes that this yet-not-constituted committee will strongly recommend liberalization of kerosene and LPG prices. Otherwise, it would be either censored or ignored under the current arrangements. The third question is related to the carefully constructed mythology of oil prices in India. One of the crucial components of the carefully nurtured mythology about oil (i.e., petrol, diesel, kerosene and LPG) prices in India is the idea that the government offers a huge subsidy to consumers. This subsidy, it is claimed routinely in government pronouncements, policy analyses and media reports, shows up as the “under recovery” of state-owned OMCs and pushes up the budget deficit of the government. The subsidization of oil products, follows the next step in the argument, is wasteful of scarce resources. It is ultimately unsustainable from a public finance perspective and should therefore be curtailed. How should this huge subsidy burden be curtailed? By withdrawing government control over petroleum product prices and letting market forces a free rein, or so runs the argument. The wide currency of this argument would be obvious from even a cursory glance at mainstream media reports related to oil prices in India. A Business Standard report last year highlighted the close to Rs. 25,000 crore of “under recoveries” of the OMCs, dramatizing this “finding” by suggesting a revenue loss of Rs. 75 crore a day. Similar reports find their way to the international media too. Earlier this year, Reuters highlighted the need for deregulation of oil prices because of the increasing burden of “under recoveries.” A special 2008 report on BBC made the same point and speculated that Indian oil companies might be losing about 100 million US Dollars (USD) a day. The Financial Times, in an editorial of July 6, 2010, argued for the need to phase out “subsidies” and end state control over petroleum prices. Such pronouncements are not confined to media reports. It is also propagated by policy analysts in various research institutes. In a series of studies starting at least as early as 2006, the International Energy Association (IEA) of the Organization for Economic Cooperation and Development (OECD) has highlighted the so-called fiscal burden of “under recoveries” of the OMC and has argued for the deregulation of oil prices. To sort through the complex of issues surrounding oil prices in India we need to address, at least, the following questions. Is the government really subsidizing petroleum products? Can “under recoveries” of the OMCs be understood as a measure of such subsidies? What, after all, are these “under recoveries”? Why is the private sector ecstatic with the deregulation of petrol and diesel prices? To answer these questions we will adopt a political economy perspective, i.e., we will try to see the class interests lurking behind the analysis of “experts”, changes in government policy and news coverage in the mainstream media. Once we carefully sort through the issues we will see that there is a simple motive force behind the whole complex of policy changes and committee recommendations: private sector PROFIT and more PROFIT. To understand the much talked about “under recoveries” of the OMCs, it would help to familiarize oneself with the structure of the oil industry in India. The industry starts at what analysts call the “upstream” end, the site of exploration and production of the primary component that gives all varieties of petroleum products: crude oil. The major state-owned players in the upstream sector are Oil and Natural Gas Corporation Ltd. (ONGC), and Oil India Ltd. (OIL); the major private sector players are Reliance, Cairn Energy, Hindustan Oil Exploration Company Ltd. (HOEC), and Premier Oil. The output of the upstream sector is crude oil, which feeds into the “downstream” sector: the sector responsible for refining the crude oil to get petroleum products (like petrol, diesel, kerosene and LPG), marketing the final products, and development and maintenance of pipelines. The major state-owned entities in the downstream sector are Indian Oil Corporation Ltd. (IOCL), Hindustan Petroleum Corporation Ltd. (HPCL), Bharat Petroleum Corporation Ltd. (BPCL), and Mangalore Refinery and Petroleum Ltd. (MRPL); the major private sector players are Reliance, Essar and Shell. The distinction between the upstream and downstream sectors give us several important prices. There are the price of crude oil, and the refinery gate price of petroleum products. The first is the price that refiners pay to purchase the crude oil (either from domestic or foreign producers), and the second is the price at which the refiners “sell” the petroleum products to the next stage of the industry. Note in passing that about 80 per cent of India’s crude requirement in 2008-09 was met with imports. Hence, this is the primary channel through which international prices of crude oil affects the Indian economy. The final sector of the industry is that which maintains an interface with the consumers, the sector which takes care of transportation and distribution of the petroleum products to the retail outlets. The major state-owned players in this sector are GAIL (India) Ltd., and IOCL; the main private sector players is Petronet India Ltd., though Reliance, Essar and Shell have also entered into the fray. This brings us to the third important price in oil industry analysis, the pre-tax price: this price can be arrived at by adding marketing, storage and transportation costs to the refinery gate price of the relevant petroleum product. Adding excise duty (a form of tax levied by the Central Government) and sales tax (levied by State Governments) to the pre-tax price gives the final retail price of petroleum products, the price, for instance, that you or any of us pay at the petrol pump. Let us summarize: the retail price of petroleum products (like petrol, diesel, kerosene and LPG) equals the sum of the price of crude oil, refining cost plus profit, marketing & storage cost plus profit, distribution cost plus dealer profit, and taxes & duties. To clarify matters further and to get a firm grasp on the various prices that we have introduced, let us work through a concrete example. In July 2009, the average international price (FOB) of crude oil was 64.618 USD per barrel, which translates into 1.538 USD per gallon and hence 19.87 rupees per liter. Note that in converting from USD to rupees we are using the average exchange rate between the USD and rupees that prevailed in July 2009: 48.83 rupees per USD. Two things should be kept in mind. First, in 2008-09, India imported about 80 percent of its crude oil consumption; second, in the current dispensation there is zero customs duty on crude oil. Hence, for the oil industry in India, the price of crude oil was 19.87 rupees per liter. 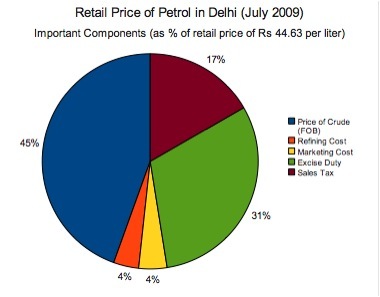 In a written reply to a question in the Lok Sabha in August 2009, Petroleum Minister Murli Deora informed that “of the Rs 44.63 a litre retail selling price of petrol in Delhi, Rs 13.75 is because of the incidence of excise duty and Rs 7.44 a litre due to sales tax.” Here we have two more prices: the retail price of petrol in Delhi(44.63 rupees per liter) and the pre-tax price of petrol (23.44 rupees per liter). As far as we know refinery gate prices of petroleum products are not publicly available; hence we cannot give exact figures for these prices. But we do have publicly available information which allows us to provide rough estimates of refinery gate prices. In a November 2006 report on the cost structure of OMCs, we learn that the average operational and function costs (excluding labour cost) of the OMCs come to about 1.9 rupees per liter. Thus, if we deduct this amount from the pre-tax price of peterol (23.44 rupees per liter), we arrive at the following rough estimate of the refinery gate price of petrol in India in July 2009: 21.54 rupees per liter. This information is summarized in Figure 1 and 2. In other words, import parity price is the price which one would pay if the good is imported. In India this is clearly not the case as demand for petroleum products (like petrol, diesel, kerosene and LPG) can be met by domestic refineries. Indeed, there is a 35% surplus refining capacity over the domestic demand (Sethi, 2010). The price at which domestic refineries can supply petroleum products (export parity price) is less than the import parity price. 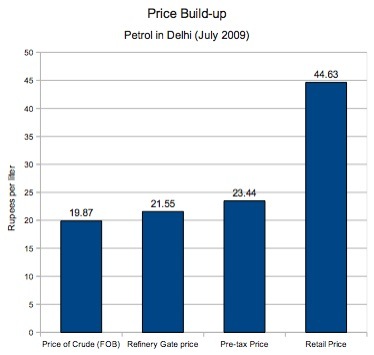 The difference was about 1.71 rupees per litre of diesel in April-Spetember 2005 (Rangarajan Committee Report, 2006, pp. 4). To correctly measure the under recoveries, therefore, a better formula would be to use export parity price as the benchmark. Using import parity price inflates the notional concept of under recovery, which is then trumpeted by the mainstream media as state-owned OMC losses. Secondly, it is also to be noted that the government had provided sumptuous subsidies towards building the refineries. It is but natural that the refineries share some burden by quoting a lower benchmark price. Instead, the private refineries are being allowed to sell products at import parity price to the state OMCs (Rangarajan Committee Report, 2006, pp. 30). The third reason why under recoveries are only notional and “are different from the actual profits and losses of the oil companies as per their published results” is that “[t]he latter take into account other income streams like dividend income, pipeline income, inventory changes, profits from freely priced products and refining margins in the case of integrated companies.” (Rangarajan Committee Report, 2006, v). Public Sector oil companies do constitute an integrated structure – the notional losses of the OMCs are therefore shouldered by the upstream firms such as the ONGC, and GAIL (Rangarajan Committee Report, 2006, 30). They also are some of the biggest profit earners of the country. Hence to talk about unsustainable susbsidies is a white lie. To sum up: first, under recoveries can only occur when there is some control over the prices that OMCs can charge the consumers; if OMC were given full flexibility in terms of setting prices, they would probably always charge a price so as to keep the under recoveries to nil. Second, most of the OMCs don’t import petroleum products (like petrol, diesel, kerosene and LPG). They buy these products from refineries which, in turn, import crude oil. Thus, import parity price – which uses the import price of petroleum products instead of crude oil – is only a notional cost that they pay for the products they sell to the consumers. Hence, “under recoveries” of the OMCs refer only to a notional value of the losses of the OMCs; it is not a real quantity which figures on their balance sheets. Thus, it is a mistake to equate “under recoveries” with state-owned OMC losses, as the mainstream media constantly does. Of course, the meaning of under recoveries will change drastically if we allow private sector players into the scenario, as we will see later. While the mainstream media commits the mistake of portraying the under recoveries of the OMCs as “losses”, government officials and policy analysts err by depicting the under recoveries as “subsidies” or “effective subsidies” (the 2009 IEA report and the Kirit Parikh Committee are notable recent examples). Let us see why. It is meaningful to talk about government subsidies in relation to a commodity only when the tax revenue generated by the commodity (for the government) is lower than the subsidy that the government offers to producers/sellers of that commodity. Another way of saying the same thing is to insist on the usage of net subsidies: if the government tax revenue on a commodity is higher than the subsidy that it offers on that commodity, then on a net basis the subsidy is a negative quantity. In such a situation it is meaningless to say that the government subsidizes the commodity. Several interesting facts emerge from Figure 3. First, the direct subsidy of the GOI for petroleum products is extremely small. In fact, direct subsidy is a tiny fraction (less than 1 percent) of the total tax revenues from the oil sector. 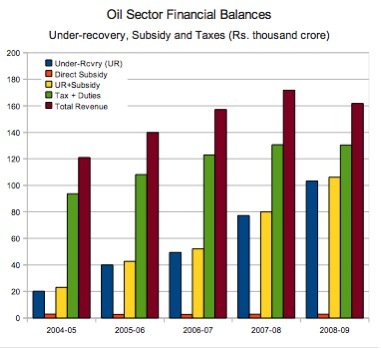 Second, the total contribution of the oil sector to the exchequer has been higher than the sum of under recoveries of the OMCs and direct subsidies on petroleum products for all the years since fiscal 2004. Third, even the sum of duties (customs and excise) and (sales) taxes on petroleum products, which is only a fraction of the total contribution of the oil sector to the exchequer, has exceeded the sum of under recoveries of the OMCs and direct subsidies in all the years since 2004-05. The inescapable conclusion from Figure 3 is that there is a negative net subsidy on petroleum products in India. Another way of saying the same thing is that the government extracts a net positive tax revenue from petroleum products in India. The oft-repeated assertion that petroleum products are subsidized in India is simply not true. WHAT ARE UNDER RECOVERIES, TRULY? We have suggested, so far in our analysis, that under recoveries of the state-owned OMC are neither financial losses (because notional prices are used) nor can they be used as measures of subsidization (because there is negative net subsidy on the oil sector). What are they? Why is the private sector and the mainstream media so concerned about under recoveries? To get a handle on this important issue, let us imagine a vertically integrated, state-run corporation that sells petroleum products. This corporation imports crude oil, much like India does today, refines it to produce petroleum products and sells it to consumers. Thus, this corporation contains within itself both the upstream and the downstream sectors of the industry, as well as the retailers/dealers. If the final price at which this hypothetical corporation sells petroleum products to the consumer is higher than the sum of the price of crude oil, the cost of refining & distribution (with some rate of return included) and taxes/duties, then this corporation would be said to be making a profit (from the perspective of the people of the country). Now, let us break up this hypothetical state-owned corporation into two parts, one of which is involved only in refining and the other only in distribution, both still being state-owned. In this case, there will be two balance sheets and the transaction that was earlier internal to the big corporation would now show up as sale/purchase between the two smaller corporations. Even in this case, we would adopt the same procedure as above to see whether the two firms taken together are making a profit: if the final retail price is higher than the sum of the price of crude oil, the cost of refining & distribution (with the same rate of return as before included for both corporations now) and taxes/duties, then the arrangement is profitable. In other words, it does not matter if “losses” show up in the balance sheet of one of the corporations as long as the government’s tax revenue is adequate to cover that “loss”. Thus, if the government administratively fixes the price of petroleum products such that the distribution corporation suffers under recoveries, it is hardly a matter for concern because (a) the government’s tax revenues are far above the under recovery of the state distribution corporation (in our example), (b) upstream firms make enough profits to bear the burden. This is more or less the situation of the oil sector in India if we consider the state-owned upstream and downstream corporations taken together. Since the total revenue from the sector, and government taxes, are higher than the “losses” showing up on the balance sheets of some of the corporations, Indian society is not making a net loss. The last and crucial step of the argument is to allow private sector players into the scenario and see how everything changes drastically. Continuing with the example, suppose now, we have, in addition to the two state-owned corporations, a private corporation. This hypothetical capitalist firm is involved in refining and distribution. Now, it is obvious that government control over prices that lead to “under recoveries” would translate into true losses or lower rates of profit for the private corporation. If the realized price is lower than the import parity price, in the balance sheet of the private OMC it would show up as loss – provided the OMC adopts the import parity price as the benchmark. But since the private firm has the refining facilities arm, like Reliance for instance, overall the firm might still make a profit because (a) taking import parity price as the benchmark means high profit margin for the refinery, (b) even without this high margin the refinery may itself be profitable enough to make up for the loss of the private OMC. Nevertheless, let us note that decontrolling the “realized price” promises even higher opportunities to earn profits for the private sector firm, as no under recovery now shows up. That really brings us to the crux of the matter as regards under recoveries. The under recoveries of the OMCs do not mean much as long as they are covered by the tax revenue of the oil sector only when private sector players are absent from the scenario. As soon as private sector players enter the picture, the under recoveries of OMCs become a proxy for the losses of private sector players. Since the private sector wants to enter the oil sector and earn windfalls, it highlights the under recoveries and policy analysts endeavor to show it as a burden and the mainstream media faithfully relays that concern. The way to remove the under recoveries, i.e., the way to ensure a positive and high rate of profit for private capital in the oil sector is to do away with cause of under recoveries: government control over petroleum product prices. Hence, the recommendations of various “experts” is to liberalize oil prices, and the GOI, by accepting and implementing that recommendation is working to ensure high and positive rates of profit for private capital in the oil sector. Let us end with an example that you can chew. From Petroleum Minister Murli Deora’s answer to the Lok Sabha we know that the pre-tax price of petrol was about 23.44 rupees per liter in July 2009; if Reliance or Essar sold petrol in Delhi in July 2009, this is roughly the after-tax revenue it would make on each liter of petrol. What would be an estimate of the cost that Reliance or Essar would bear for a liter of petrol? In July 2009, the average international (FOB) price of crude oil was, as we have already noted, 64.618 USD per barrel, which translates into 19.87 rupees per liter.. Thus, if Reliance or Essar imported crude for their refineries, they would pay about 19.87 rupees for each liter. What mark-up over processing and marketing cost would they want? The average international pre-tax price of gasoline in July 2009 was about 2.33 USD per gallon; since the international price of crude oil was 1.538 USD per gallon, this implies a mark-up over processing and marketing cost of 1.515 (= 2.33/1.538). Thus, for an international oil company, the price of petrol (gasoline) was set at about 152 per cent of the cost (of crude oil). It seems reasonable to assume that Indian capital would also like a similar, if not higher, mark-up over cost. Thus, in July 2009 Reliance or Essar or Shell would have liked to be able to set a pre-tax retail price that was 152 percent of the cost of crude oil. So, what pre-tax price of petrol in India would have been required to ensure an internationally competitive mark-up over processing and marketing cost? The answer is 30.20 rupees per liter (= 19.87 * 1.52). Now things are clear. According to the Petroleum Minister, the pre-tax price of petrol in Delhi was only 23.44 rupees per liter in July 2009; that meant, using an international rate of return benchmark, a 6.75 rupees per liter less profit for a private sector player like Reliance. That, it is clear, was enough to create a hullabaloo about under recoveries and fiscal burden and the efficiency of the market and push the government to set up the Kirit Parikh Committee and decontrol petrol and diesel prices. Profit, you see, is what this whole fuss is about. The Times of India has reported that diesel prices have not yet been fully deregulated. This is misleading. The very first paragraph of the press release of the government (http://www.pib.nic.in/release/release.asp?relid=62834) says: “In the light of Government’s budgetary constraints and the growing imperative for fiscal consolidation, and the need for allocating more funds to social sector schemes for the common man, the Government has decided that the pricing of Petrol and Diesel both at the refinery gate and the retail level will be market-determined.” (emphasis added) The next sentence of the press release has the caveat that the TOI report picks on: “However, in respect of Diesel, the initial increase in retail selling price of Diesel will be Rs. 2 per litre at Delhi, with corresponding increases in other parts of the country. Further increases will be made by the Public Sector Oil Marketing Companies (OMCs) in consultation with the Ministry of Petroleum & Natural Gas.” So, it is true that any price increase of diesel which is over Rs. 2 will require government consent at the moment, but this seems mere window dressing given that the principle of market-determined retail prices has been accepted and loudly affirmed. Paragraph 4.43, Kirit Parikh Committee Report. To be more precise, we will need to add the the cost of insurance, ocean freight, ocean loss; this quantity is typically assumed to be about Rs 50 per tonne (http://www.projectsmonitor.com/detailnews.asp?newsid=9540). Since it is not very large, for our current computation, we will ignore it. An impressive share, I simply given this onto a colleague who was doing just a little analysis on this. And he in reality bought me breakfast as a result of I found it for him.. smile. So let me reword that: Thnx for the treat! But yeah Thnkx for spending the time to debate this, I feel strongly about it and love studying extra on this topic. If doable, as you turn out to be experience, would you mind updating your blog with more details? It’s highly useful for me. Huge thumb up for this blog publish!